For over a year now, my oldest son has been completely obsessed with a popular series on Cartoon Network called Ninjago: Masters of Spinjitzu. 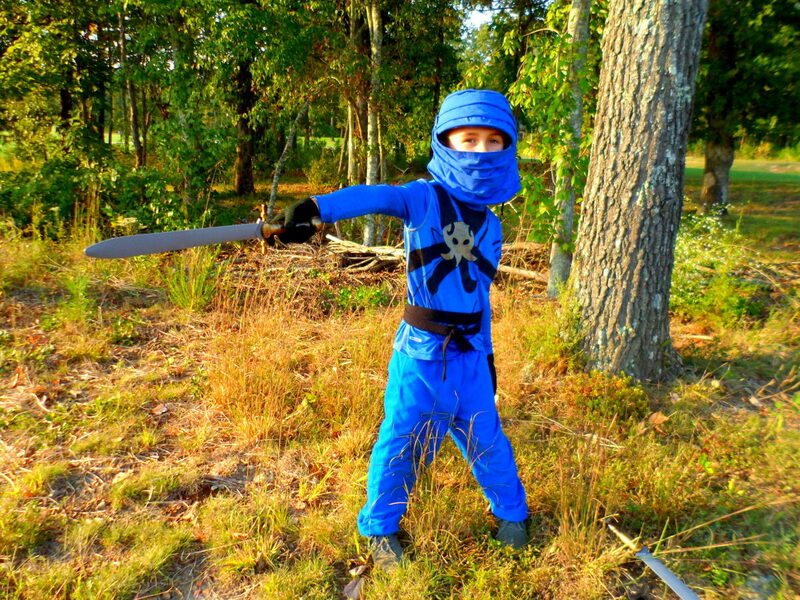 So when I asked him what he would like to be for Halloween, it came as no surprise when he said that he wanted to dress up as the blue ninja named Jay. One would think that with this show's rising popularity that you would be able to find these costumes everywhere, but the Lego company has yet to release any official Ninjago costumes. After learning this shocking news, I knew I would have to get a little crafty and make a homemade costume for my son. With a little research and all of his Spinjitzu expertise, my son and I were able to create an outfit that he could wear on Halloween night and for dress up play after. 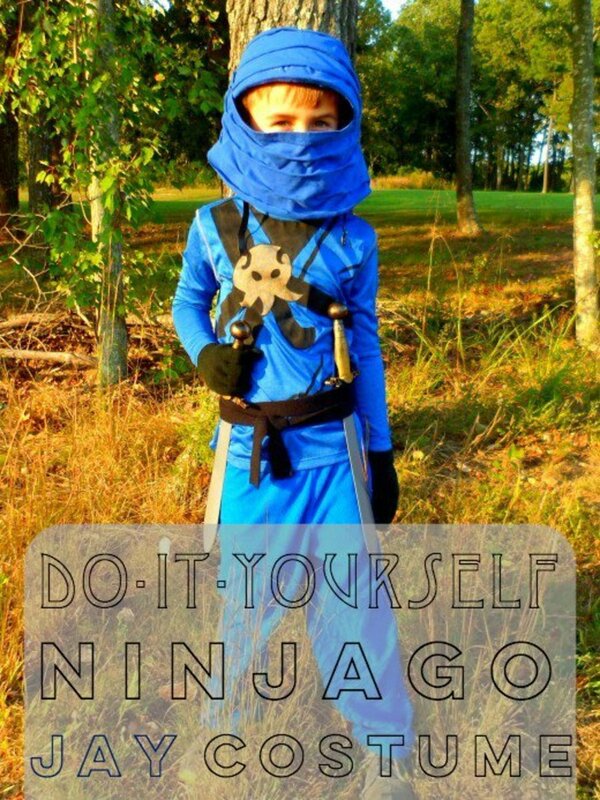 For more information on our do-it-yourself project, read further for a list of the necessary supplies and step-by-step instructions to make your own Ninjago Jay costume. 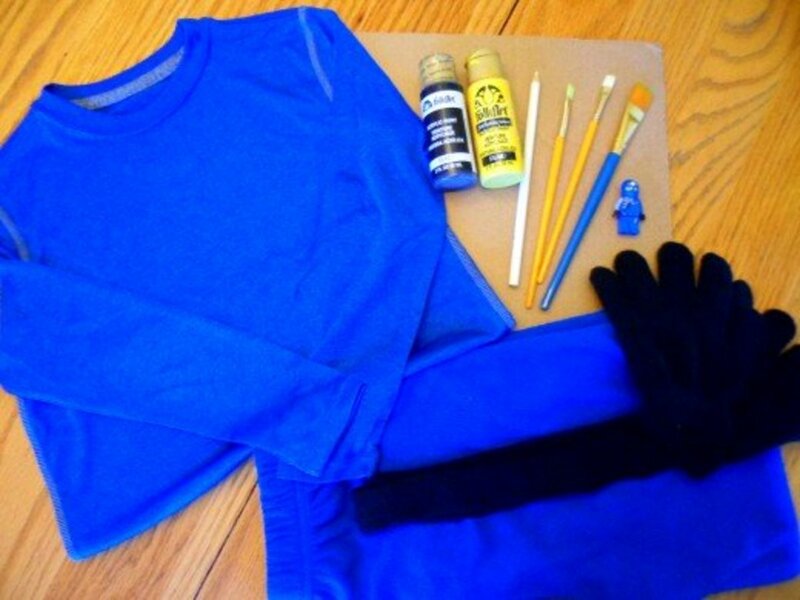 For the top of this costume, I knew I had to find a royal blue, long-sleeved shirt that would be easy to paint on. I found a Starter Dri-Star shirt at Walmart for $7.00 that I knew would be perfect for this project. Next, I searched the Internet and went through my son's Ninjago collector cards to find the design I wanted to create on the top. 1. 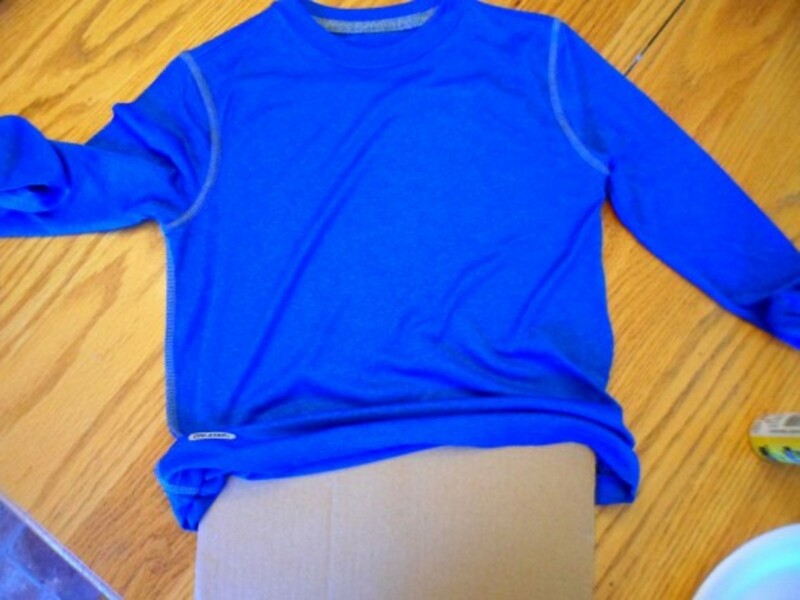 Place a piece of cardboard in the inside of the shirt to prevent any paint from bleeding through to the other side. 2. 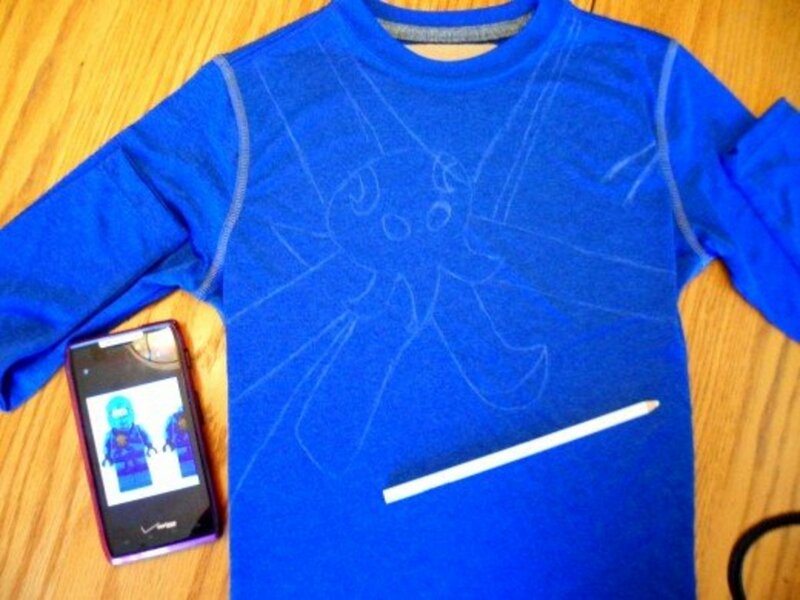 Sketch out the design on the front shirt with a white colored pencil. It helped me to have a picture of Jay laying beside the shirt while I was drawing the design. 3. Apply gold paint to the body of the character in the middle of the design. Use black paint on all other parts of the design. 4. 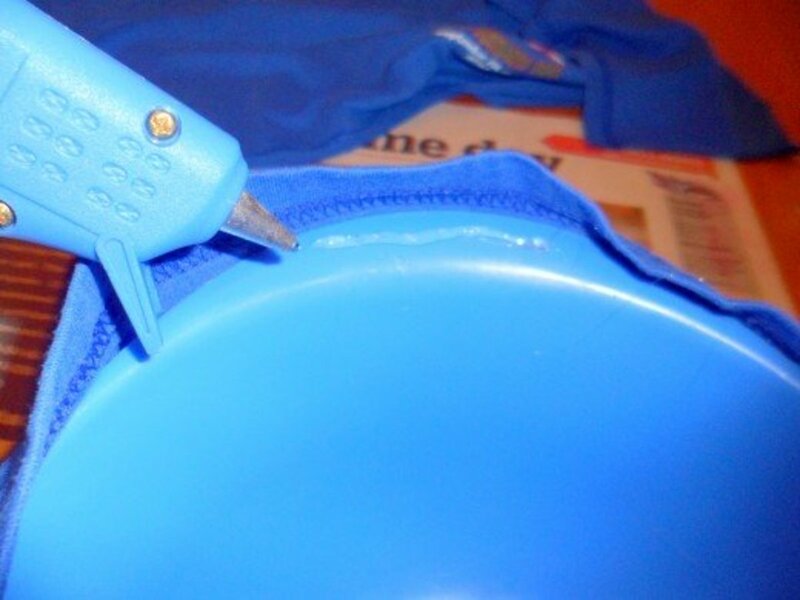 When you are finished painting, place the shirt in a safe place to dry. 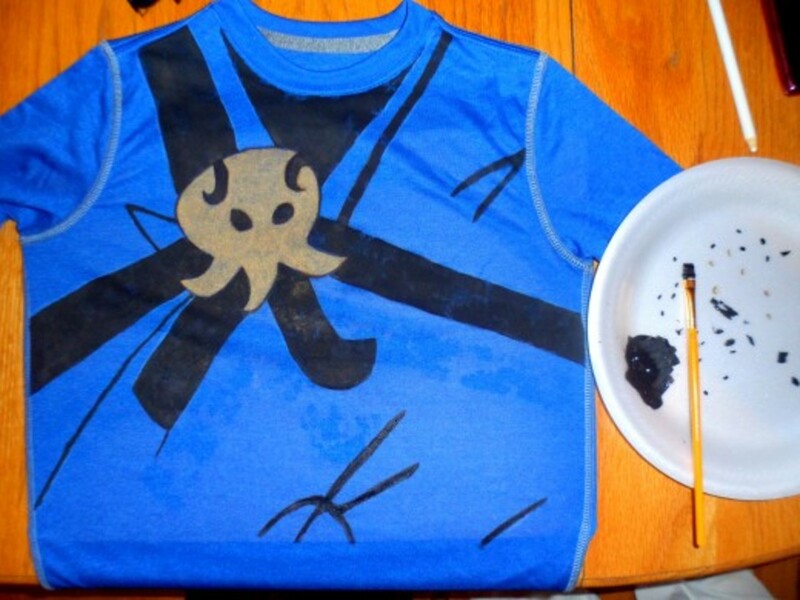 Our shirt took about three hours for the paint to completely dry. To be completely honest, I had no idea how I was going to make Jay's head covering. 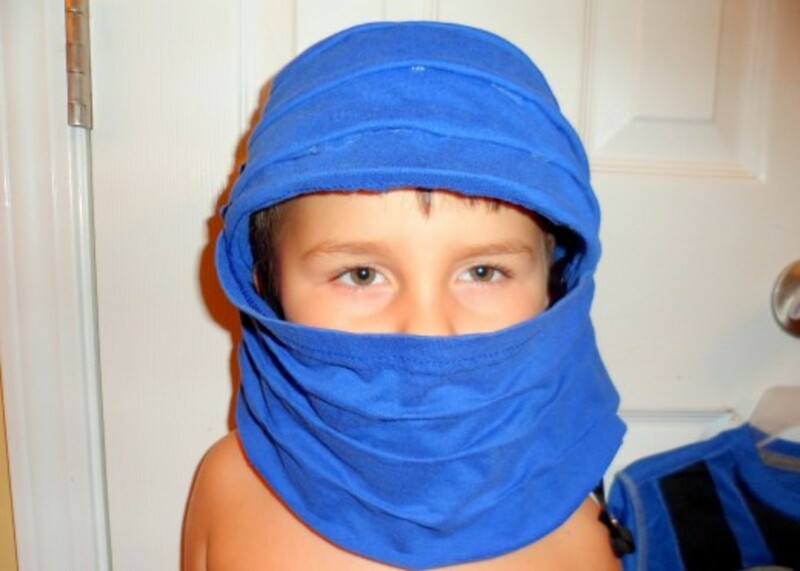 I cut up one of my old royal blue t-shirts and tried several different ways to wrap the fabric around my son's head, but it just didn't look like one of the Ninjago characters. It finally hit me that I needed to wrap the fabric around a helmet to give the hood a little more shape. 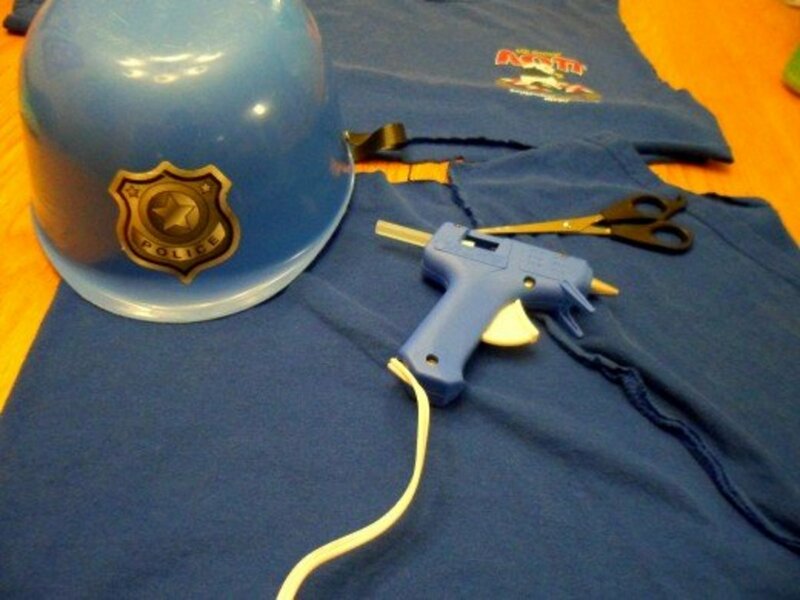 I found an old police helmet in our dress-up bin, plugged in my hot glue gun, and got to work. Below are the supplies I used and directions for creating Jay's hood. 1. 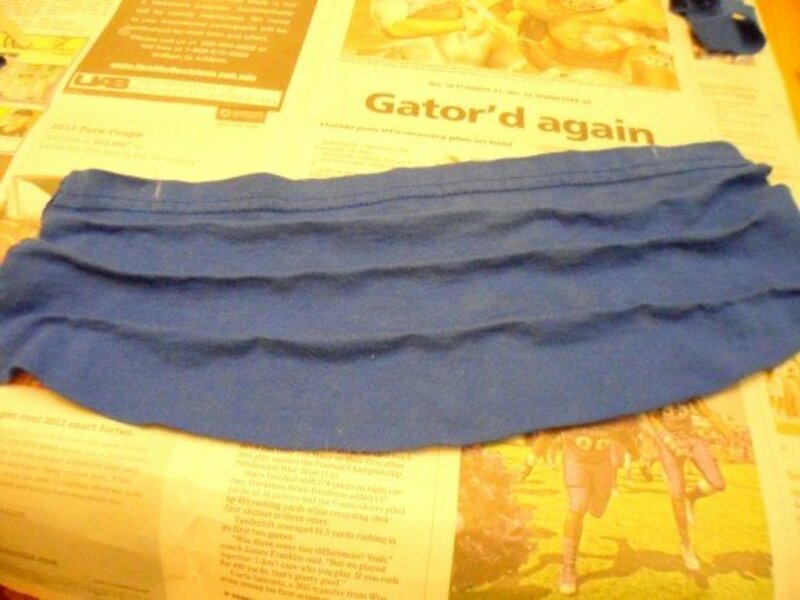 For the royal blue fabric, we cut the sleeve off of an old t-shirt and used it for the face covering. 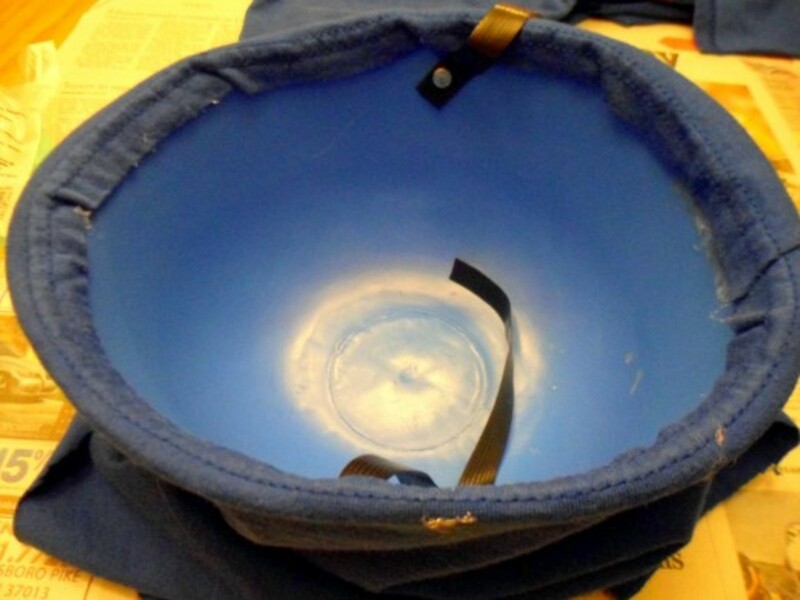 Then we cut the bottom portion of the shirt off and used this part to cover the helmet. 2. Turn your plastic helmet upside down. 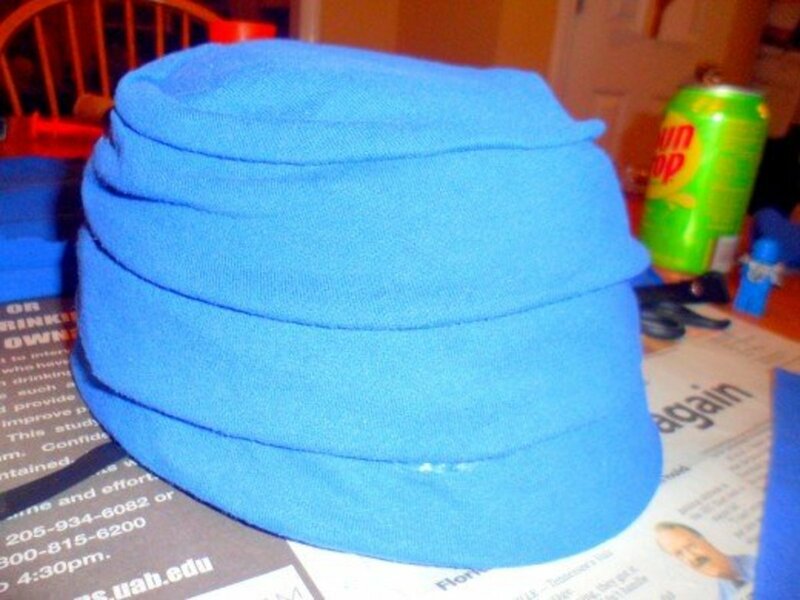 Apply small sections of hot glue around the edge of the helmet and wrap the blue fabric all the way around. 3. Once dry, flip the helmet back over and start securing the fabric to the helmet with hot glue. 4. 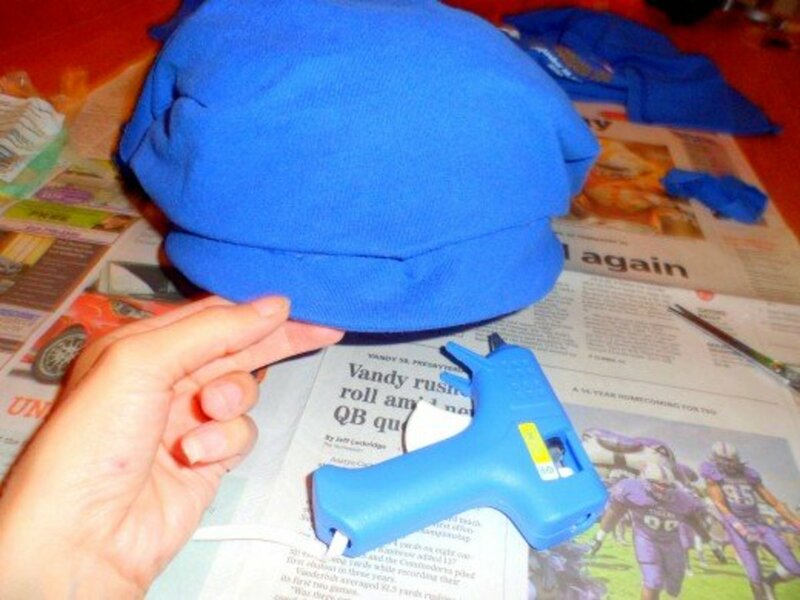 To make the creased appearance, apply the hot glue in small, thin lines and pinch the fabric together all the way around the helmet until you reach the top. 5. For the back of the helmet, tie a knot to connect the edges of the fabric. Apply hot glue under the knot and press firmly to the helmet to secure in place. 6. To create the face covering, I again used small, thin lines of hot glue and pinched the fabric to make the same creased appearance of the helmet. 7. 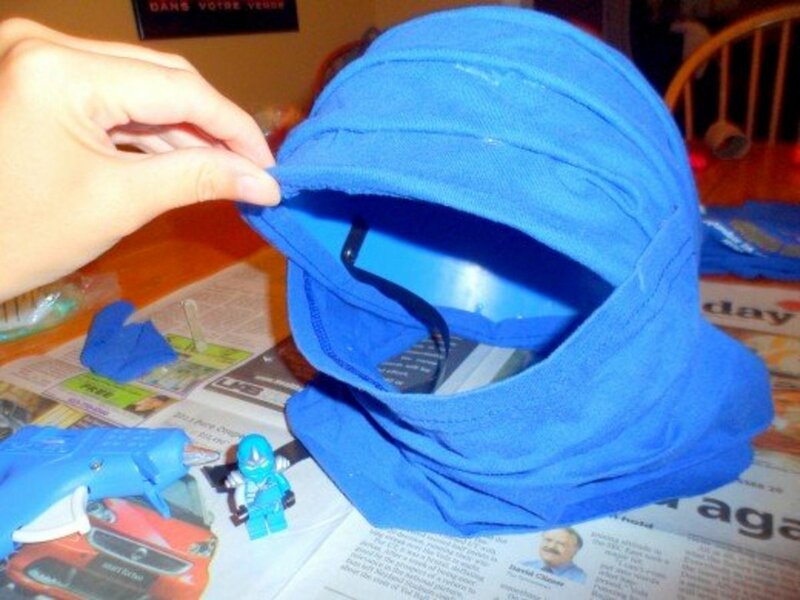 Attach the face cover to sides of the covered helmet with hot glue. 8. Once the glue is completely dry, have your child try on the helmet and mark where the mouth covering should be glued on the helmet. Apply hot glue to the sides of the helmet and press firmly to secure in place. 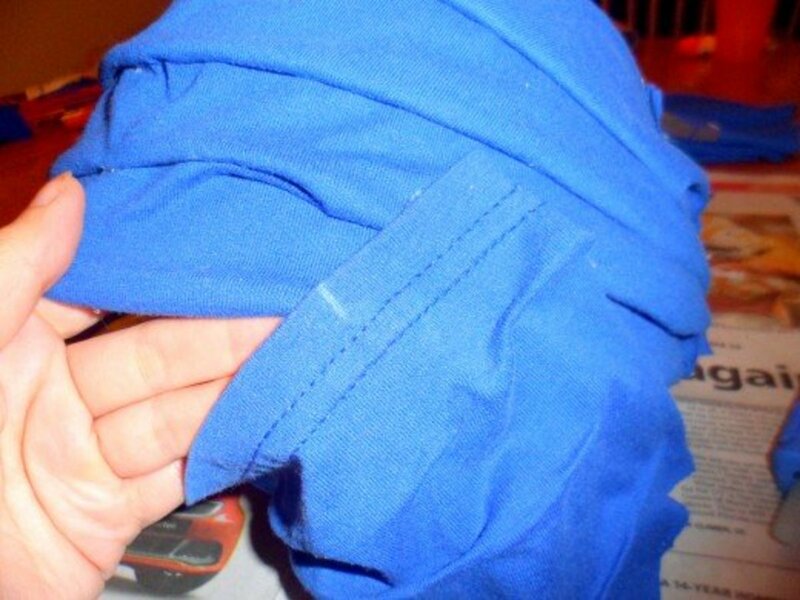 Royal Blue Pants - For our costume pants, we simply used a pair of royal blue pajama bottoms. 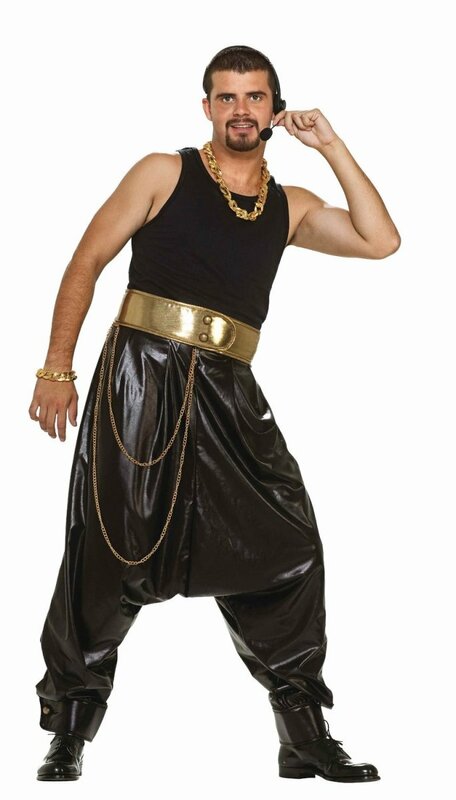 You could also use a pair of athletic pants to complete the ninja look. Black Belt - The belt we used was taken from one of my wrap-around black sweaters. If you don't own a similar belt, cut a long strip of fabric from a stretchy black t-shirt to wrap around your child's waist. Black Gloves - Since Jay's hands are black, we picked up some basic black gloves from Walmart that you can purchase in a two-pack for only $0.99. Weapon - Jay's weapon of choice is nunchucks, so my son will be carrying a plastic pair that he received as a gift from a ninja dress-up set. 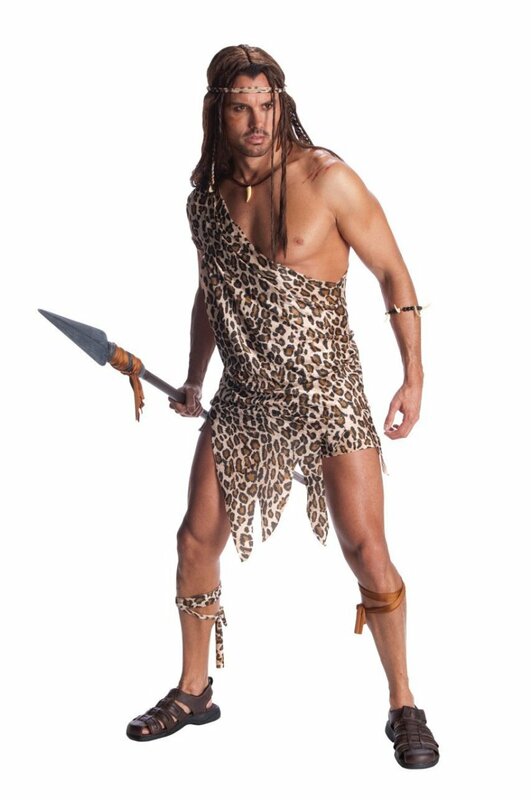 If you can't find nunchucks, no worries, as any type of ninja sword will also work with this costume. Which of the four main Ninjago characters is your favorite? 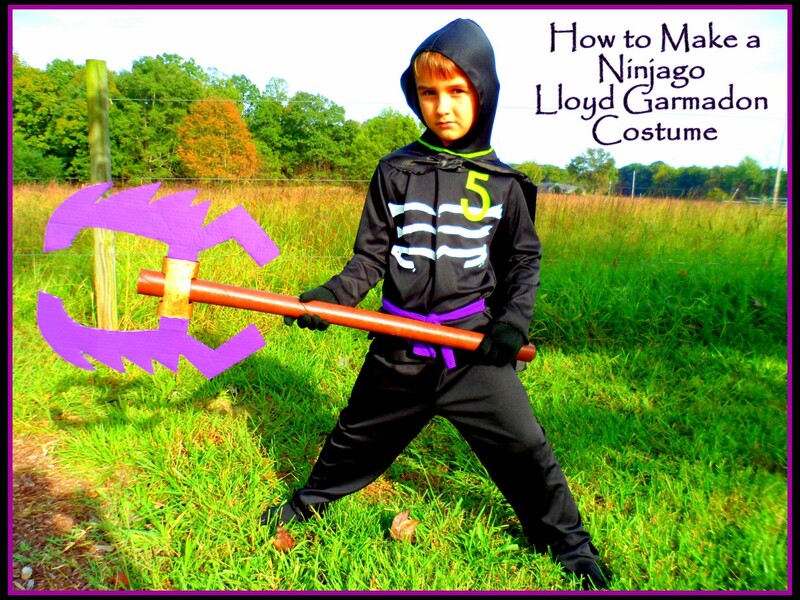 If your child has another favorite Ninjago character in mind, you can apply the same steps above in making a homemade costume to resemble that character. For example, if he or she loves Kai, the Ninja of Fire, then you will need an all red outfit with a black belt and pair of gloves. 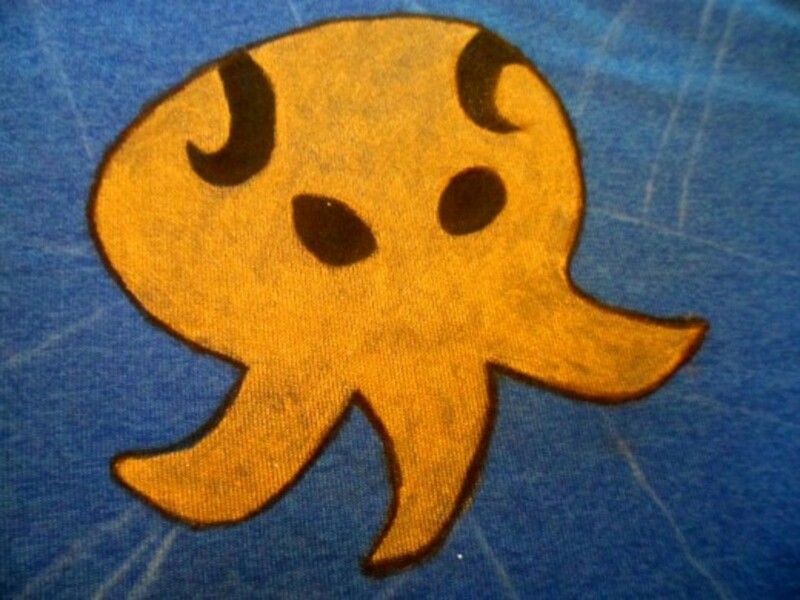 Search the Internet for a picture of Kai's ninja wear and print it out to help you with creating the design on the shirt. 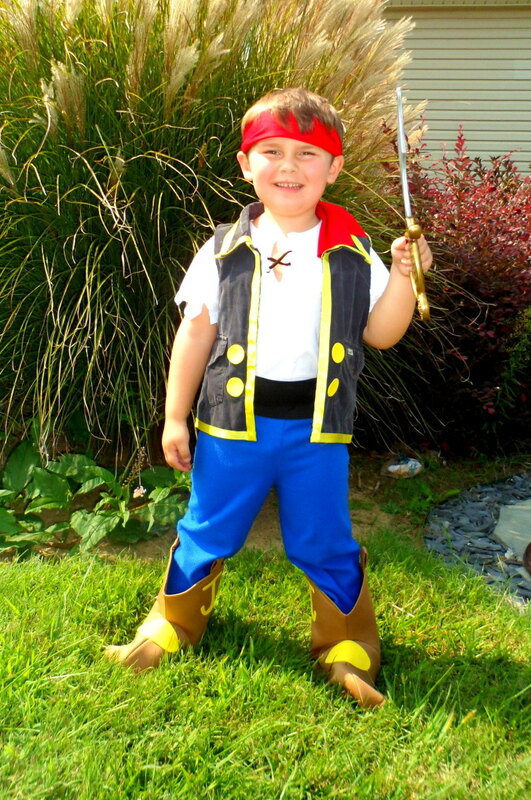 With a little bit of research and creativity, it is possible to make the costume of your child's dreams. I hope you have been inspired to create your own Lego Ninjago costume. If you have any questions or comments about our homemade Jay costume, feel free to leave these in the comment section provided below. Tha ks so mich for these instructions. I have been looking for a red ninjango easter basket with no livk. I am going to follow the mask part of the instrctions and make it into a basket. Thank you so much for posting this! My 3 year old son is now obsessed with Ninjago and all of the Halloween costumes are both crazy expensive and too big to fit a 3 year old. I will most definitely be recreating this! Now if only he would quit changing his mind between being Lloyd, Jay and Kai! So awesome to hear this one is coming in handy. I wish I could find this helmet to take a pic of the back to show you. I basically tied the two ends in a knot at neck and secured them with hot glue. Above that had the same pleated look as the front. Hope this helps and your son enjoys his costume! this is great! thank you. totally inspiring. and i've never used a glue gun before so it should be interesting & fun. i am curious as to what the back of the helmet looks like. i'm doing Zane, the white guy. Have done the t-shirt and am now settling down to do the helmet and face cover. I'll add some dark "mad" eyebrows with face paint. My son is very excited. thank you! Hi Shanda! So awesome to read your comment. Makes me happy that this hub is coming in handy to other parents out there with lil Ninjago fans. Appreciate you stopping by and commenting! Hi TattooKitty! 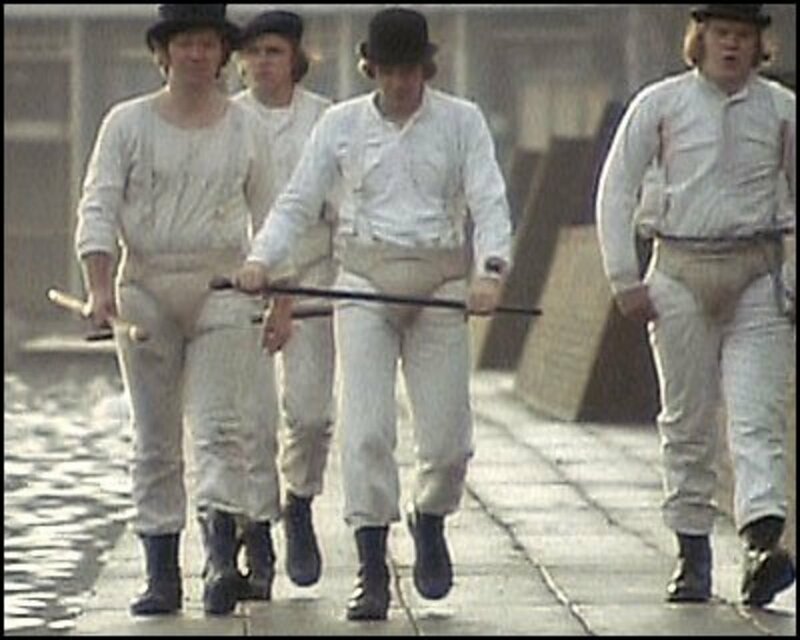 I would love to see adults dressed in these costumes too! You got to share a picture if you decide on making one :) Appreciate you stopping by and thanks so much for the vote up! 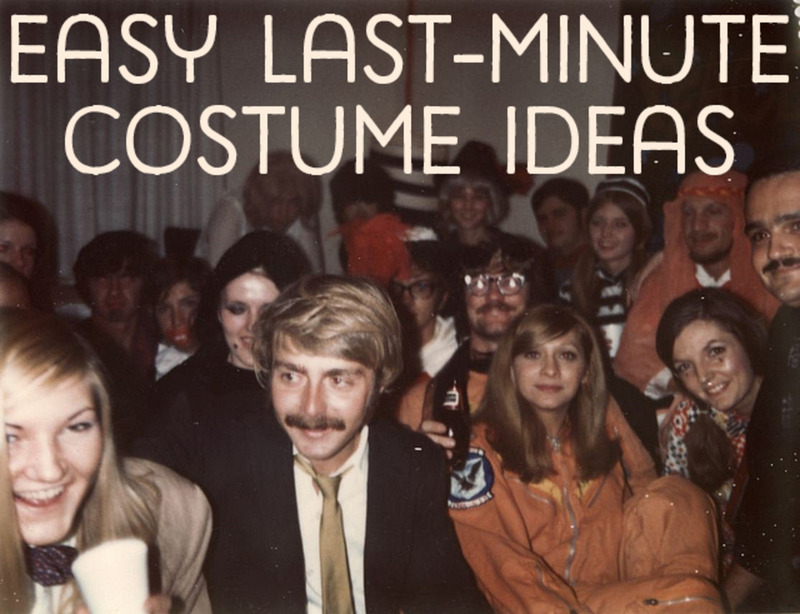 Hi Laura - so happy to hear you have found these instructions helpful to create this costume! I am not the world's best seamstress either but I can draw and paint when I have a picture handy to go by. Wish you the best of luck in making yours :) Thanks so much for stopping by and leaving your comment! 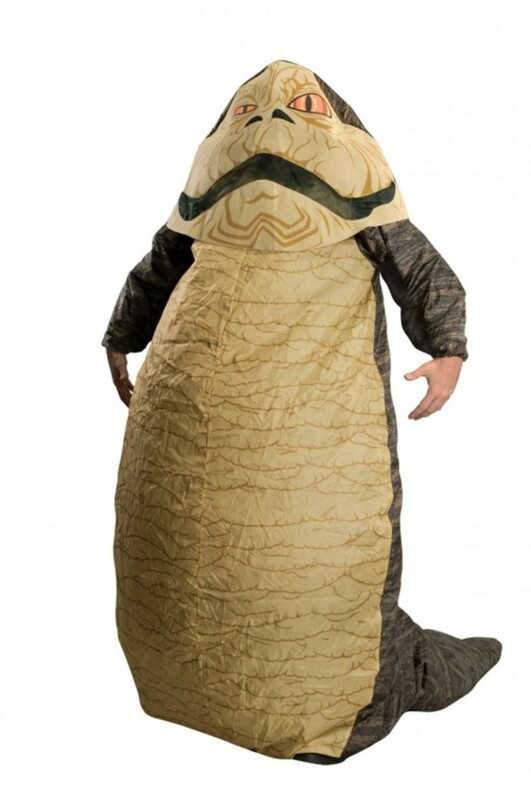 This costume is so awesome!!! My huband & I love Legos; I can SO see myself making an adult version of this! Thanks for the how-to...voted up! Thank you so much for the easy ninjago costume. I have no clue how to sew and didn't know how I was going to pull off that costume. I am now excited to make it happen with your instructions! Thanks so much for your kind comments and for the the vote up! Since Lego hasn't released any kind of official costume line, I hope this hub will help all the parents out there whose kids want to dress up as these popular Ninjago characters. Appreciate you stopping by! 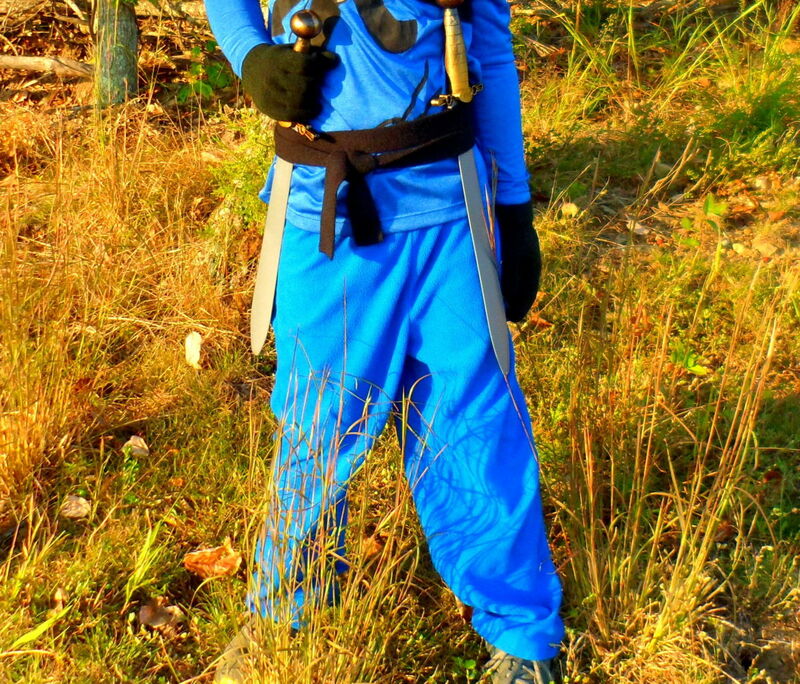 Your blue ninja looks like he's having so much fun in this costume. 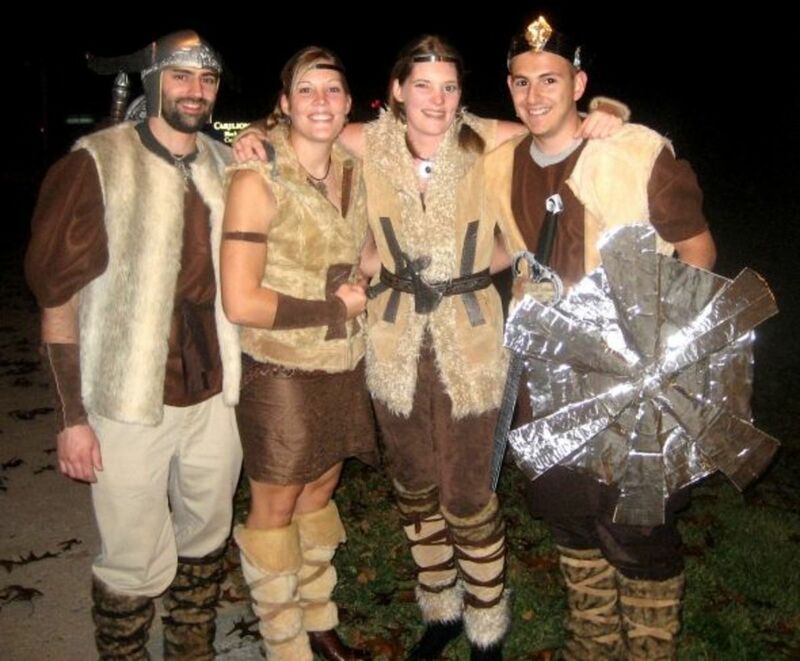 What a very creative costume and I am sure your hub will make the hit list on popularity this coming season. Voted up. Haha your nephew sounds just like my son! We will have a 20 minute conversation about what happened on the latest episode of Ninjago and yes I admit I zone in and out of the conversation :) Hope your sister finds the hub helpful if she decides to make a homemade costume! Thanks so much for stopping by and for the vote up! I finally know who my nephew has been talking about for so long! He wants to be a ninja for Halloween and he talks to me about a "cool show" he watches, but I've never been able to put the words with actual pictures in my head. Sometimes my brain unintentionally tunes him out. Now I get it!! I will share this hub with my sister because I believe she has been looking for a costume with no success. Thanks. Voted up.